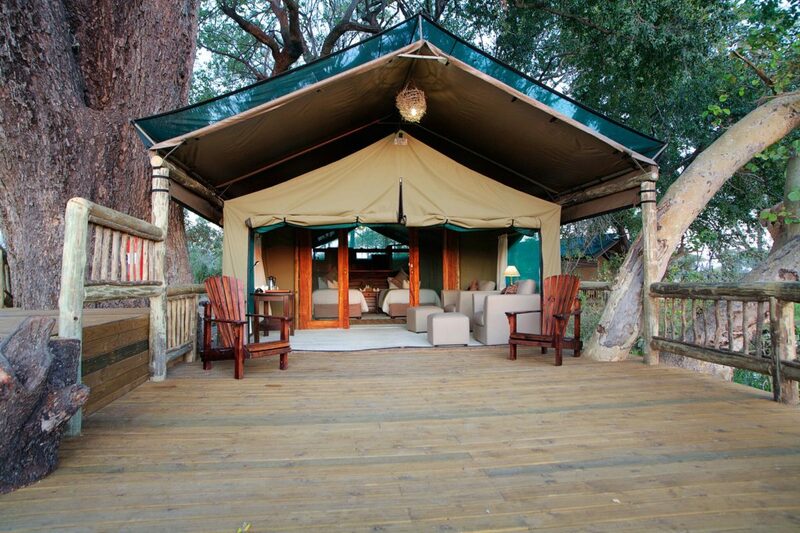 The vintage Gunn’s Camp is intimate, with only 6 tents. 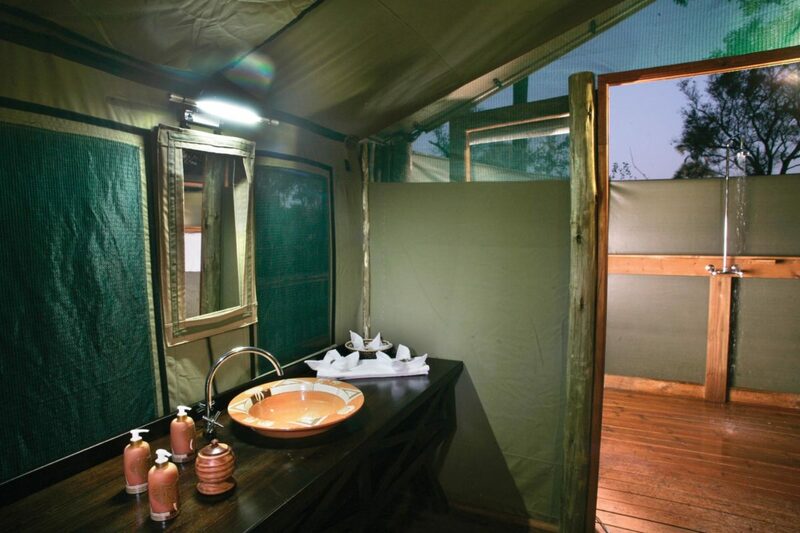 It is one of the original safari camps in the delta but has gone through a process of modernization – so it is up-to-date with the latest eco-friendly practices, using solar energy throughout the camp. 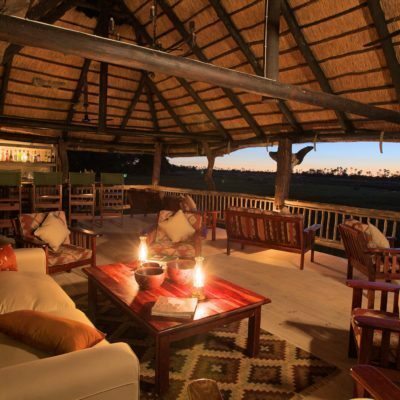 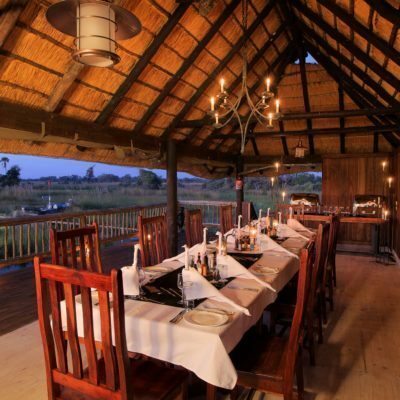 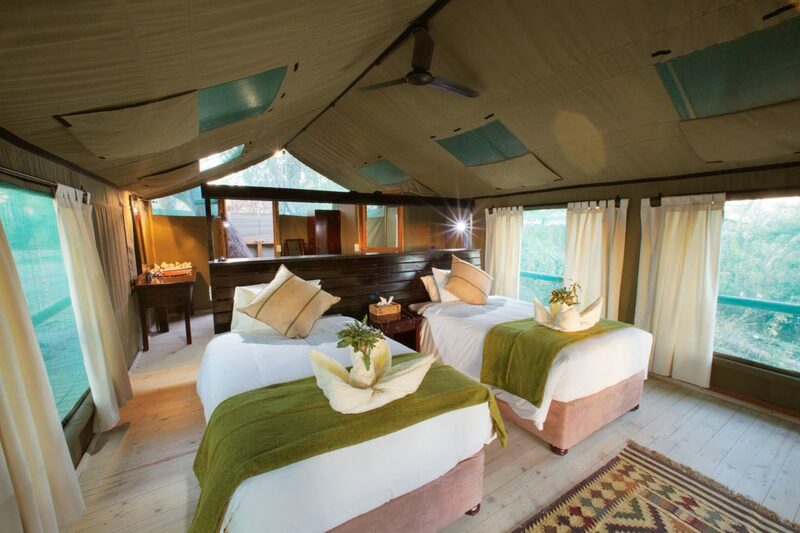 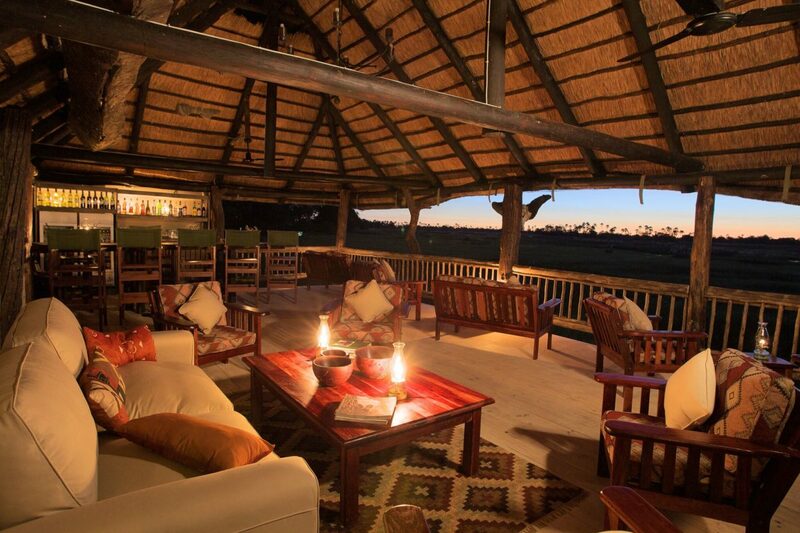 It has retained the classic tented camp style, with raised “Meru” tents over-looking the Moremi Game reserve. 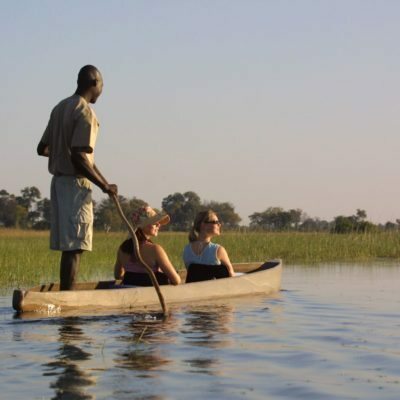 It’s sister camp, Moremi Crossing is nearby on the same island. 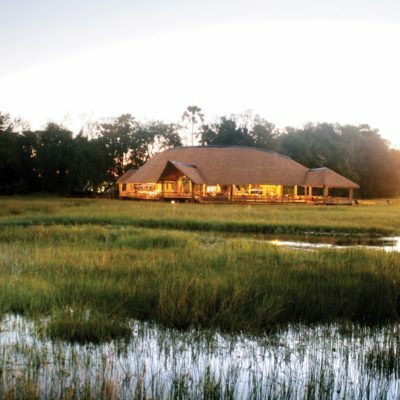 This allows Gunn’s Camp to charge far less than other exclusive delta lodges – it is very affordable for the experience you get and this is why we like it! 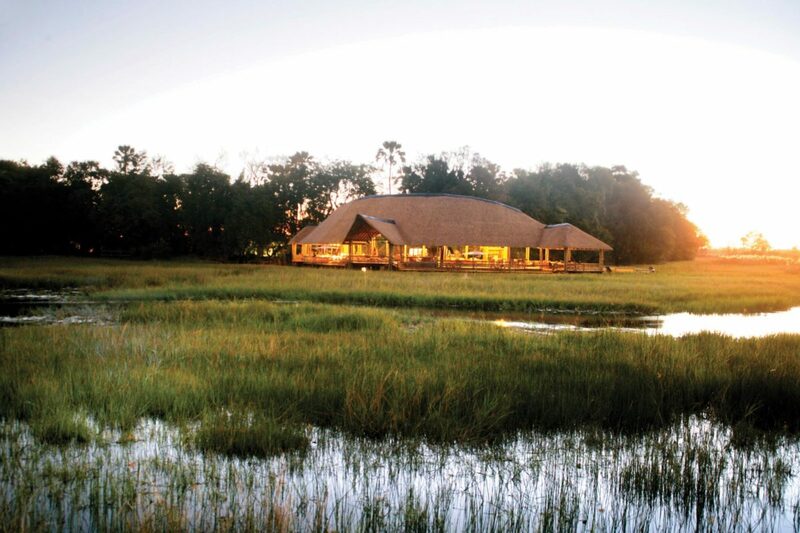 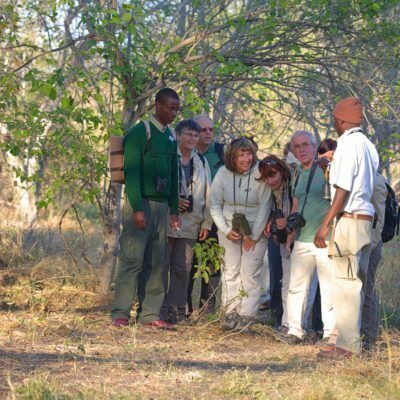 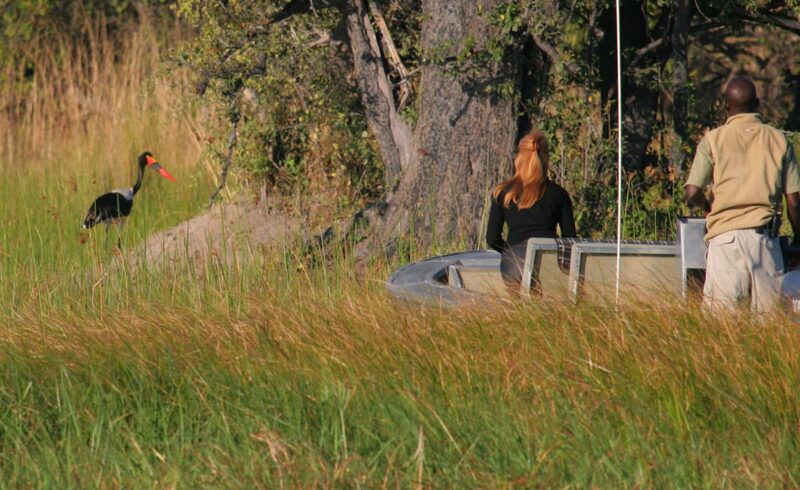 You can fly into Gunn’s Camp – this lodge shares an airstrip with moremi Crossing. 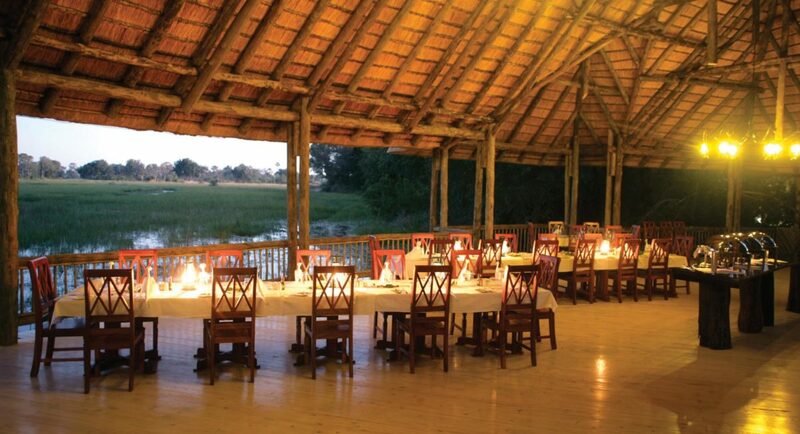 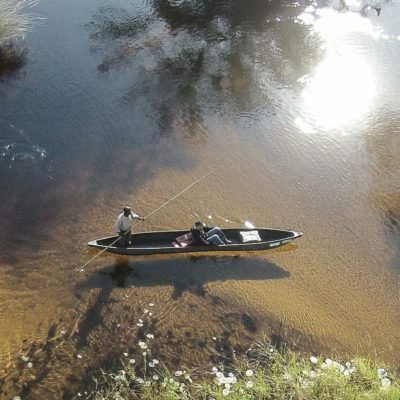 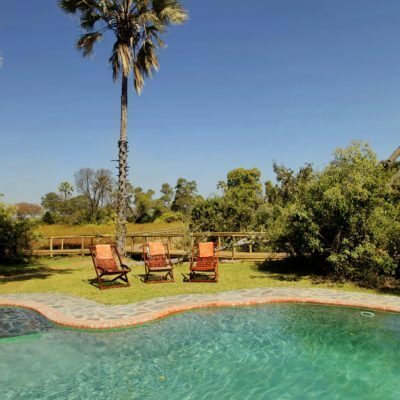 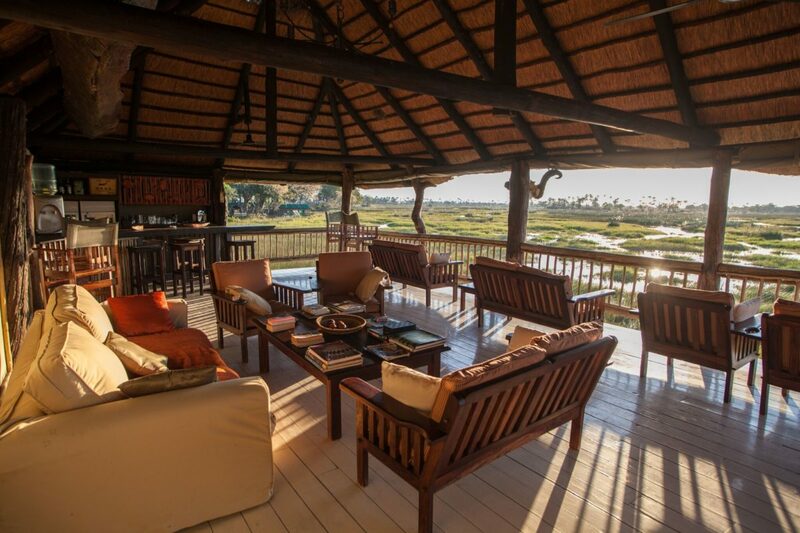 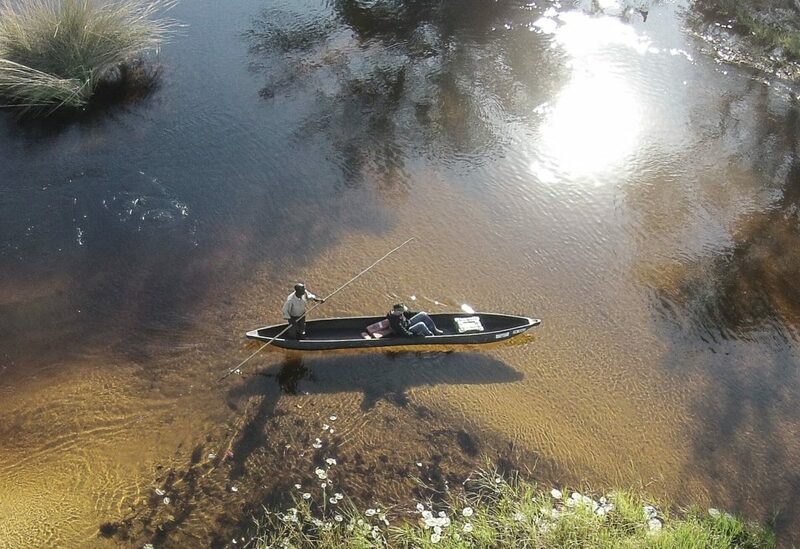 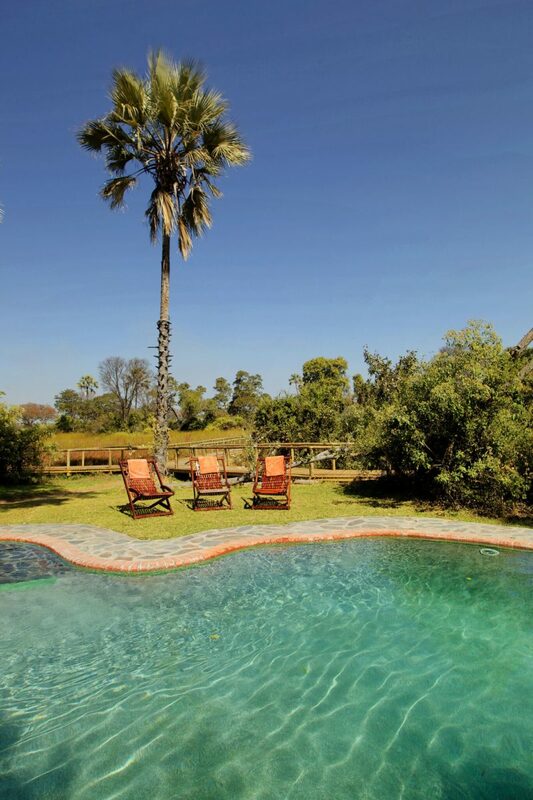 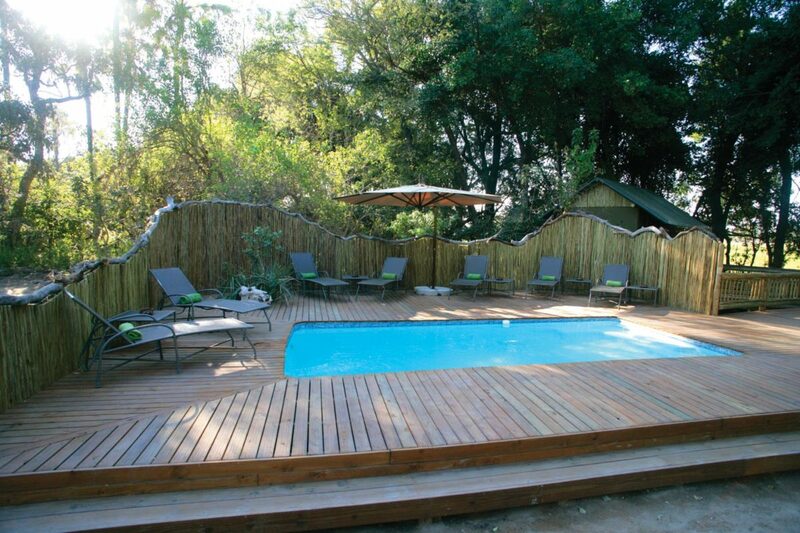 Even better would be to boat into this lodge from Maun – please inquire for details. 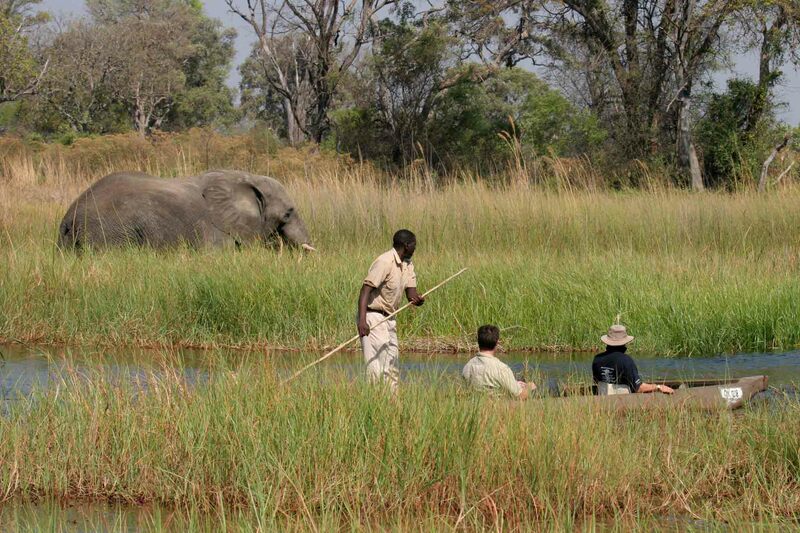 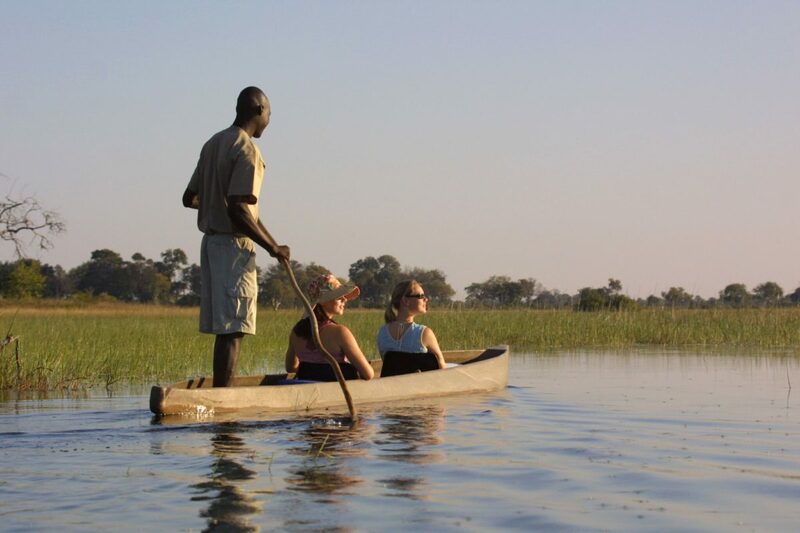 This is a “water camp,” so expect to spend most of your time being guided on the water by boat or mokoro. 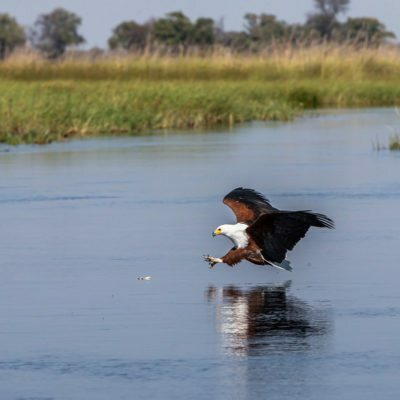 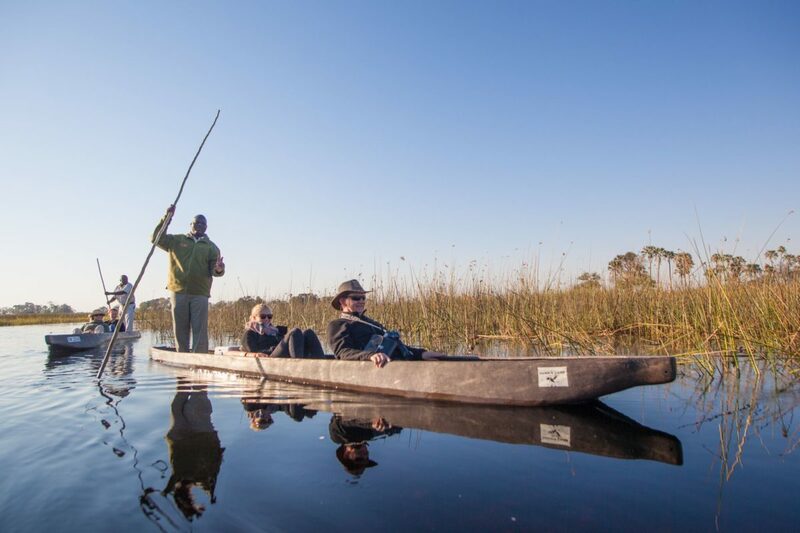 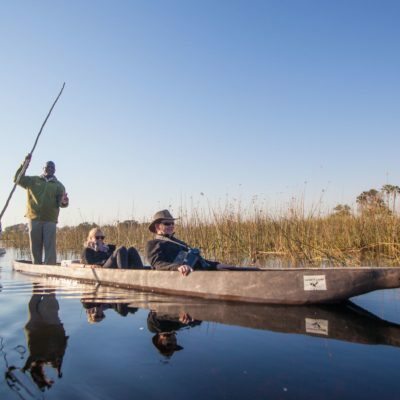 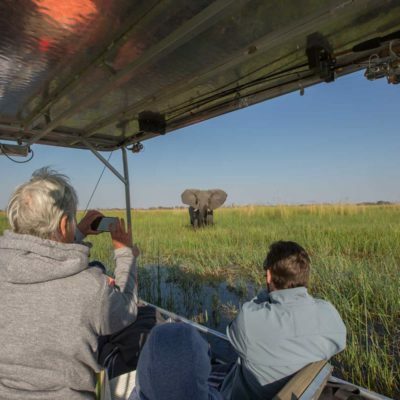 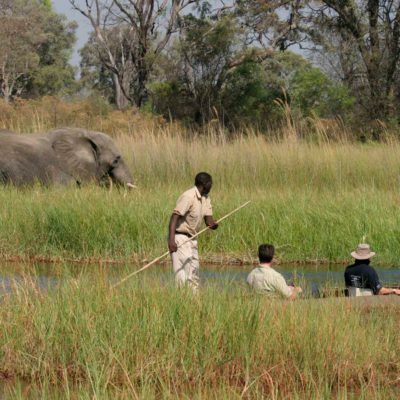 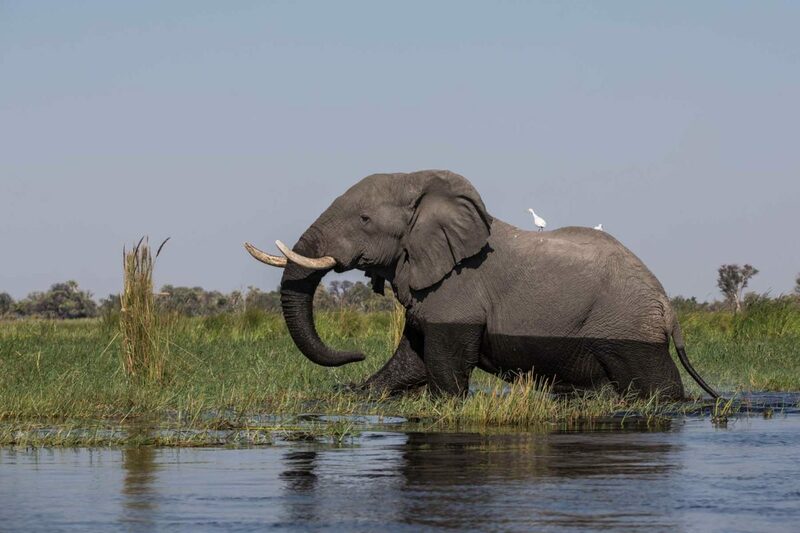 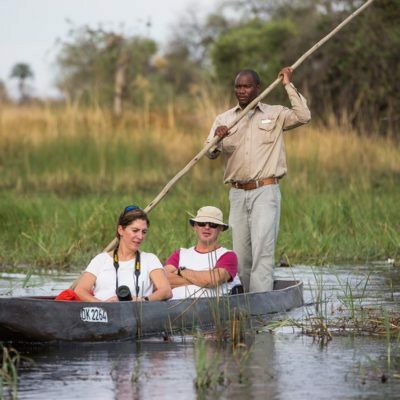 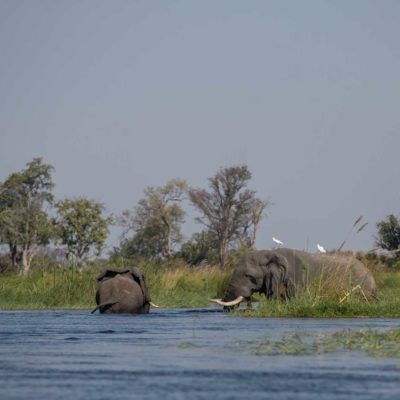 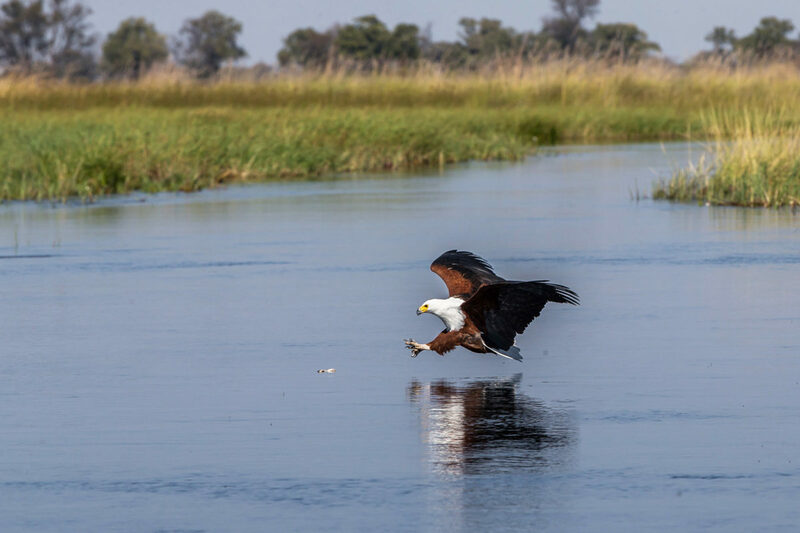 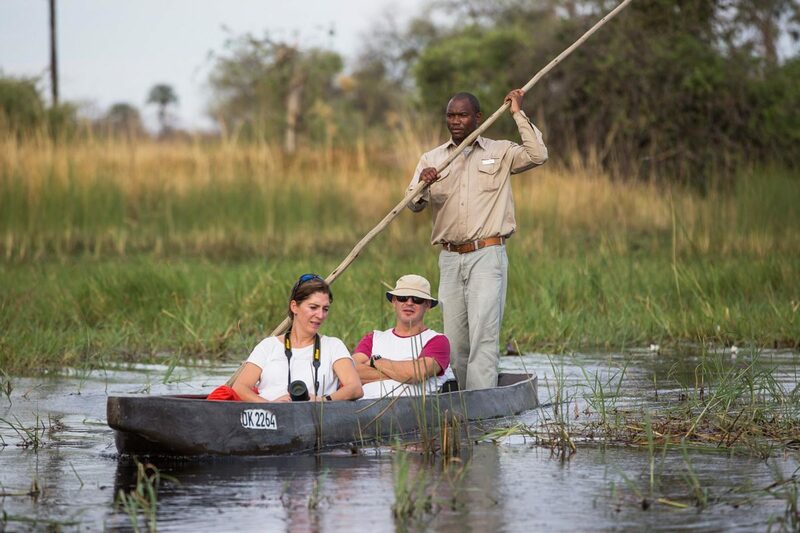 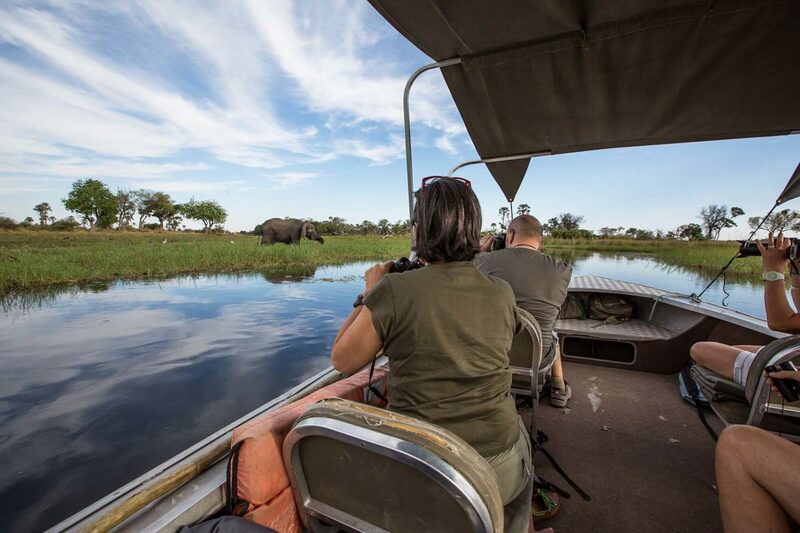 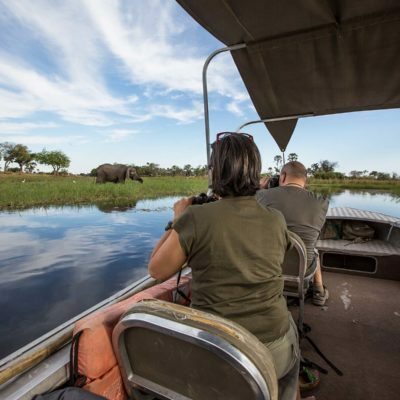 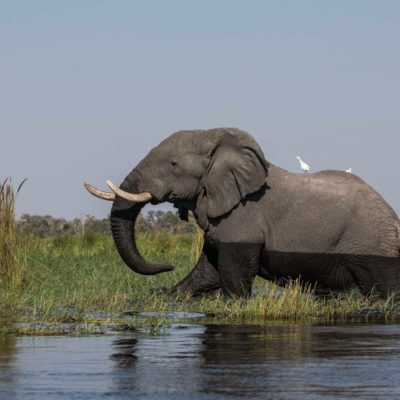 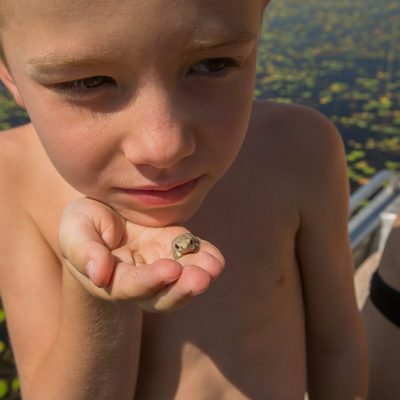 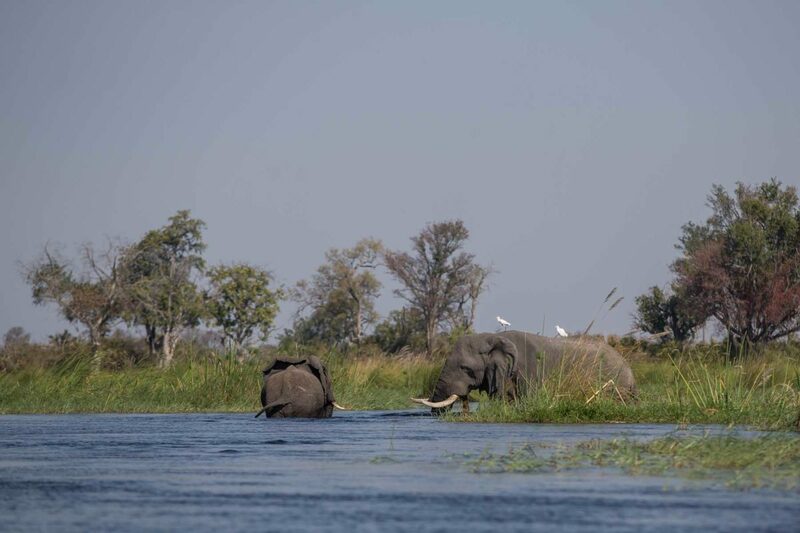 Most of the guides and “polers” (the drivers of your mokoros) originate from the delta and so are experts at propelling these craft and finding the hard-to-spot wildlife for you. 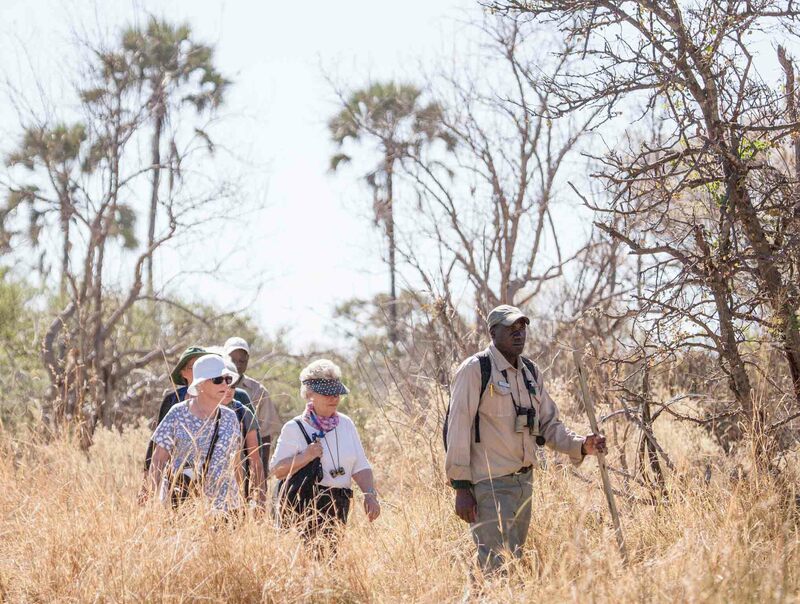 The islands surrounding the camp are excellent for walking and it is even possible to walk on the Chief’s Island mainland. 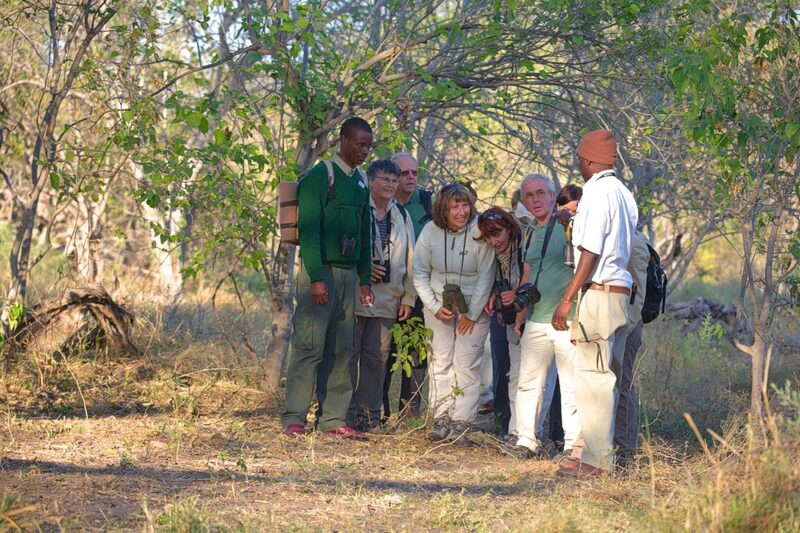 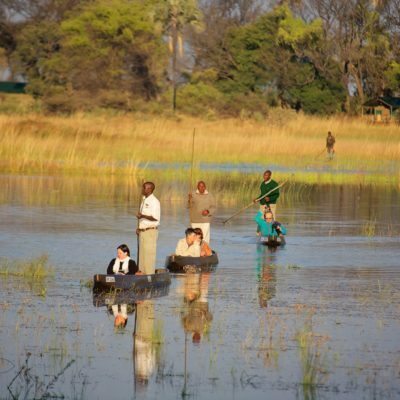 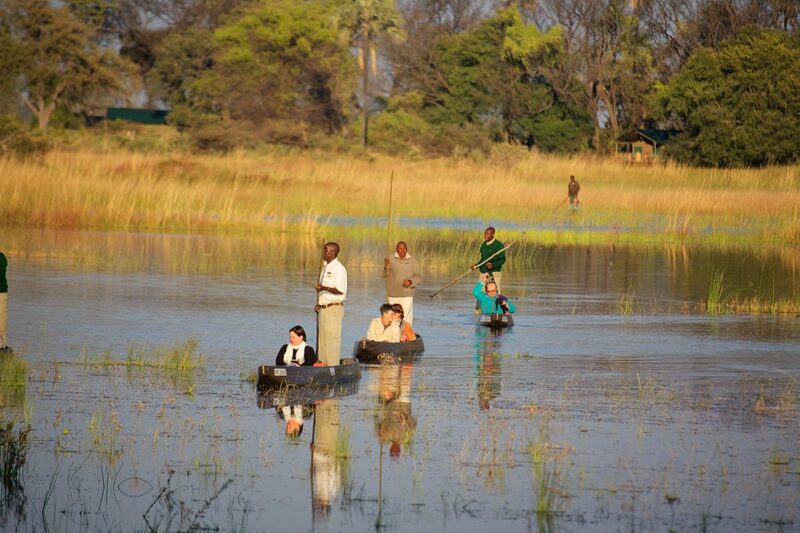 Walks are mostly conducted in the early morning, using the non-motorised mokoros to access the walking islands. 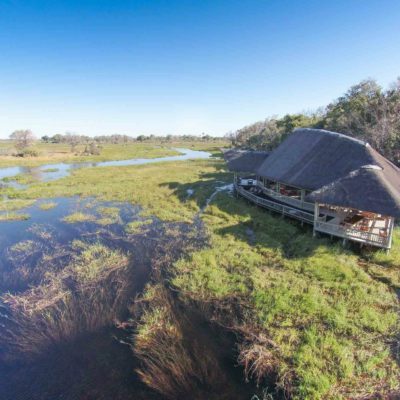 Island camping: Your camp is loaded onto mokoros and you are “poled” deep into the Moremi Game Reserve to a remote island to camp for the night with your guide. 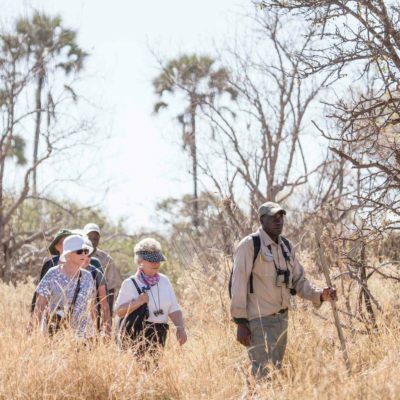 This is a great way to explore the area further than most will get to. 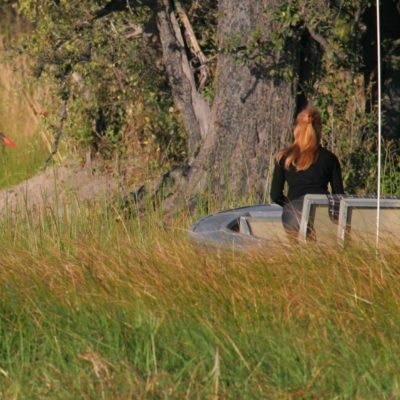 During “low water” months, the river and flood plains in front of Gunn’s Camp can dry up (flood times vary greatly from year to year), so do ask us for advice on what activities may be suspended. 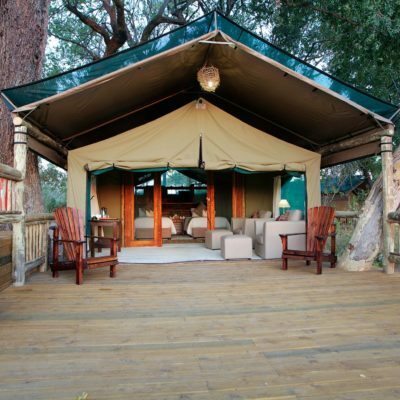 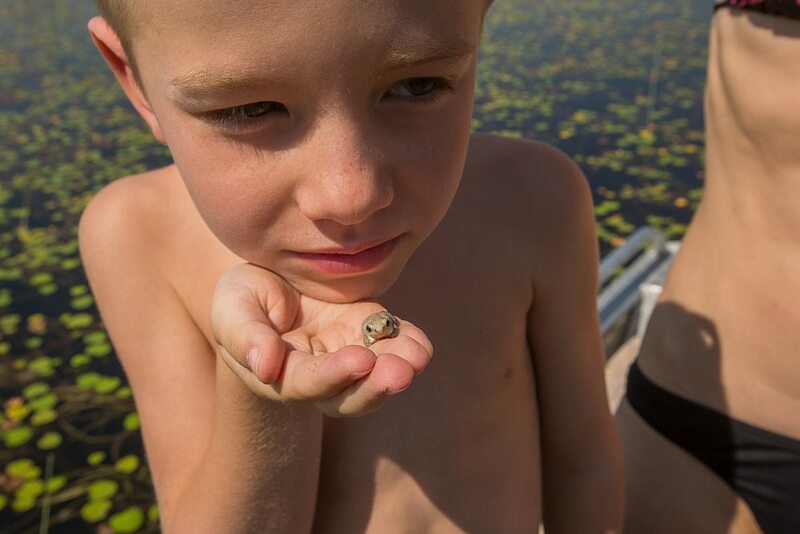 We like Gunn’s Camp because it retains the charm it has from being one of the pioneer lodges in the delta. 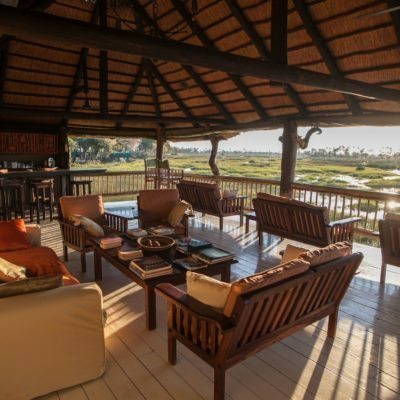 Although recently rebuilt, it has not gone the way of over-the-top opulence by keeping the creature comforts relatively simple. 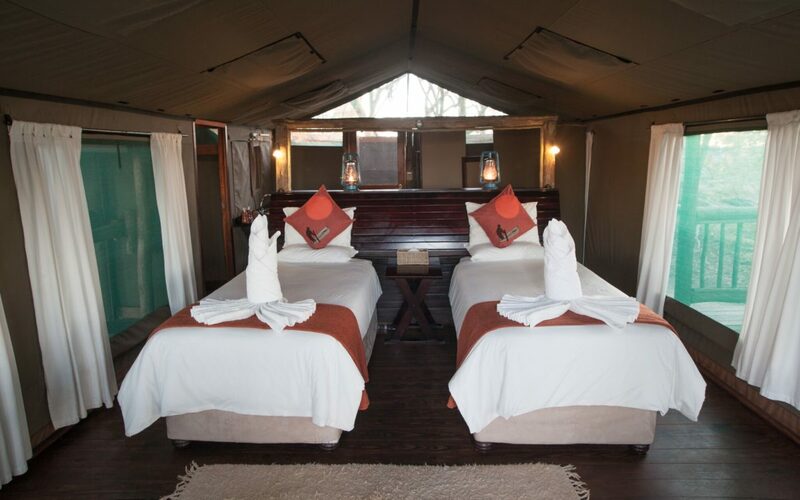 Your stay will however, not be short of comfort. 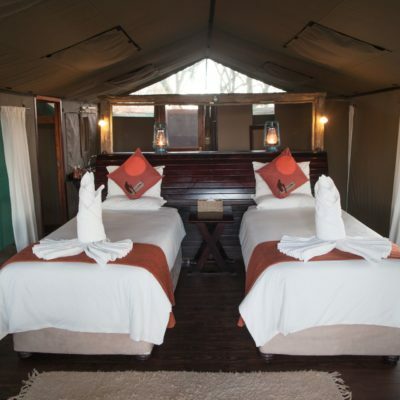 The camp has East African style “Meru” tents with full en-suite facilities, a swimming pool and a raised main area for maximising views. 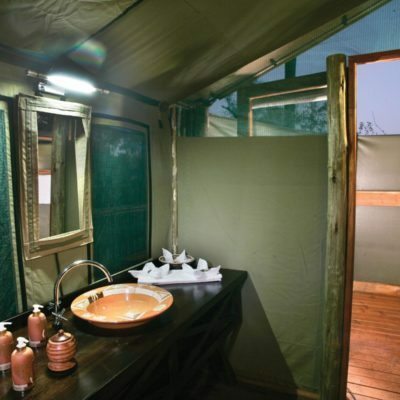 The tents are accessed by walkways over the floodplains – you really would be living out in the delta during your stay here! 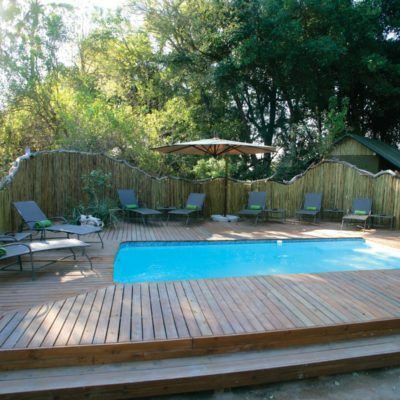 This is a good camp because it is one of the most competitive rates you will get for such a small camp. 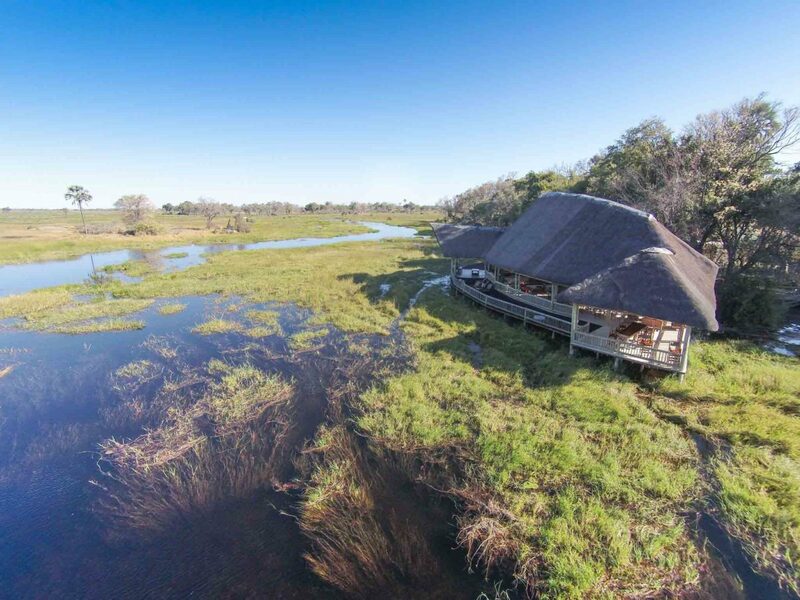 You see, it is on the same island as it’s sister camp (Moremi Crossing), so they run it under one property, which allows them to be able to charge less! 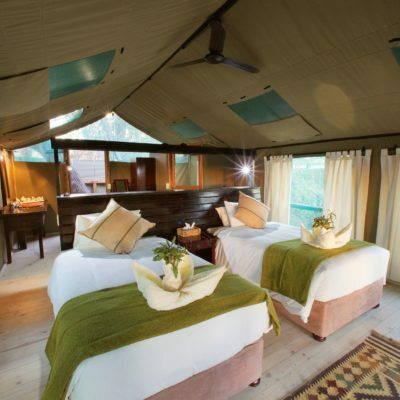 So, with only 6 tents in camp, this represents real value. 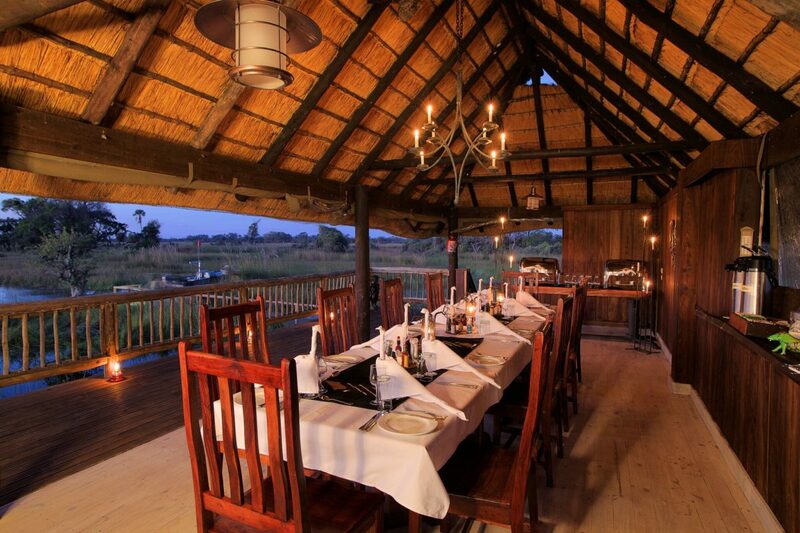 The food, atmosphere and guided experience are of a ‘no frills” standard. 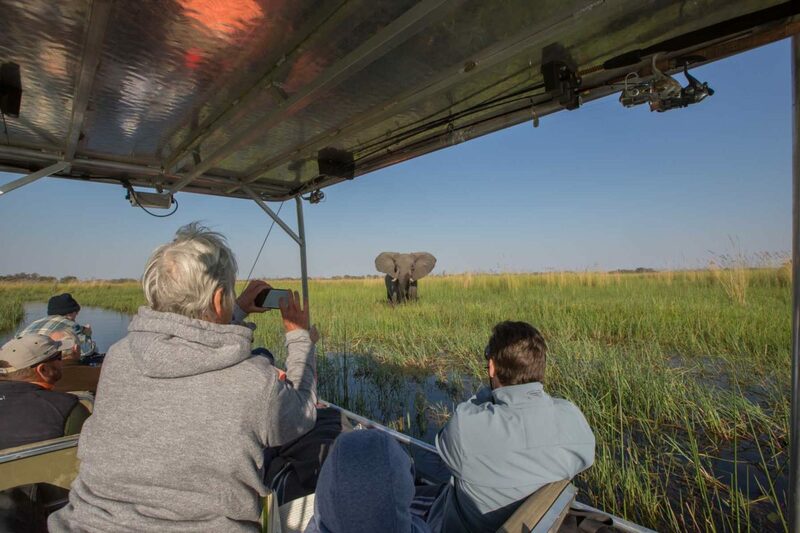 If you want to improve the guided experience, we can access this property in our private safari boats with our private guides – do inquire about this option.